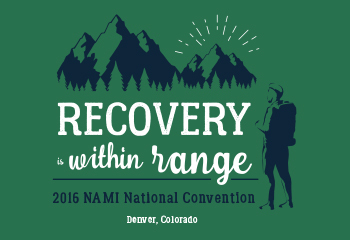 This past July marks the twelfth year I’ve had the privilege of supporting the Consumer Welcome Center at the National Alliance on Mental Illness (NAMI) National Convention. This year’s theme was Act, Advocate, Achieve. These are welcome calls-to-action for Beacon Health Options. Our core values reflect our focus to act with integrity, build community, foster resiliency in ourselves and those we serve, treat all with dignity, and advocate for continual improvements in behavioral health awareness and systems of care. The Welcome Center is a microcosm of both NAMI’s theme and Beacon’s core values. 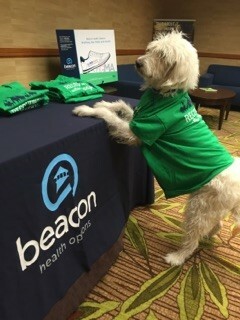 Beacon has sponsored the Welcome Center for 15 years, providing a place for persons with mental illness who attend the conference to convene, meet others from around the country, and share experiences and activities. Most importantly, we staff the Center with peers and other Beacon team members to assist attendees who are experiencing stress or a potential crisis. Our staff from all over the U.S. – this year from Colorado, Connecticut, and Texas – provide hours of support to conference attendees, offering comfort, sharing their stories, and giving friendly advice on how to maximize the conference experience. We also ensure access to a licensed psychiatrist during the event, who can provide counseling and write prescriptions for attendees who forget regular or adjunct medications. Of the varied opportunities I have enjoyed in 16 years with Beacon as a Manager of Behavioral Health Education and Recovery, running the Welcome Center has afforded me the most unique and rewarding experiences. It is more than gratifying to loan an ear and an encouraging word to countless attendees, to take those who have forgotten medications to the pharmacy, and, if needed, spend the night sitting with someone having suicidal ideation. I came on board in 2005, when the conference was held in my home state of Texas. My Texas peer and family advocates and I had no idea what we were undertaking. Our team and the community psychiatrist who provided coverage dealt with issues that ranged from mild conference-related stress, to medication interactions, to helping to stabilize someone experiencing a crisis. Over the years, the Welcome Center has grown to be a mainstay of the event with each conference having its own unique personality. I have met consumers, family members, and advocates from all over the country and experienced many stories of hope and recovery. This year, for example, there were a handful of emotional support dogs at the conference. These dogs empower their owners to undertake activities that were nearly impossible without them. A perennial favorite is Hunka Hunka Burning Love, a Bernese Mountain Dog mix who has attended numerous conferences with his delightful owner. As you can see, even the dogs like our t-shirts! In spite of the ongoing growth and visibility of the Welcome Center, it’s the contact with individuals who need our support that keeps me coming back. It is more than gratifying to loan an ear and an encouraging word to countless attendees, to take those who have forgotten medications to the pharmacy, and, if needed, spend the night sitting with someone having suicidal ideation. Beacon Acts by sponsoring the Welcome Center and local NAMI chapters. We Advocate by promoting recovery and our Stamp Out Stigma campaigns. We Achieve by helping event attendees learn and grow through the convention experiences. Making it possible for us to provide these supports to persons living with mental illness demonstrates that Beacon is a company that acts, advocates, and achieves on behalf of people with mental illness every day. For us, it truly is all about the people we serve.